The game of mahjong (or mah-jongg) is another famous Chinese invention and export to the rest of the world. Mahjong is a game combining skill and chance broadly similar to the card game of rummy ➚; the aim is to collect related groups of tiles, however the set of tiles and rules are a lot more complex than for cards. Like Chinese chess it is often played in tea-houses and the clattering of tiles on tables is a frequently heard background sound. The tiles were originally made of bone, bamboo or ivory but now are made from plastic. In a search for evidence of an early use of the game, no definitive evidence pushes it back before the Taiping Rebellion but pastimes are rarely mentioned in old history books particularly when played by ordinary people rather than the scholarly elite. The oldest known sets come from about 1870 in the Ningbo region of Zhejiang, perhaps by Chen Yumen ➚ 陈鱼门 Chén Yúmén (1817-1878). On the other hand the mystique of an ancient game from the mysterious and exotic East was a major selling point, so it is possible it was invented more recently. Some people have said it goes back all the way to the time of Confucius but there is no evidence for this. The names normally used for the tiles indicates the export to America came from the Guangdong (Canton) area. It was originally known as 麻雀 má què or ‘sparrow game’ in English and is still known by that name in southern China; while in the north it is 麻将 má jiàng. Mah-Jongg, became a great craze as a parlor game in the 1920s when the U.S. company Abercrombie & Fitch ➚ had great success in popularizing it; there were a number of trade marked versions of the game including ‘Pung Chow’ and ‘Game of Thousand Intelligences’. 36 Circle tiles in 4 identical sets of 9 tiles with one to nine circles engraved on them. In Chinese they are 筒子 tǒng zi meaning ‘barrel’ or ‘tube shaped’, named after circular coins with a hole in them. The circles are also known as ‘tans’ or ‘dots’. 36 Bamboo tiles in 4 identical sets of 9 tiles with one to nine bamboo stems engraved on them. Bamboo in Chinese is 竹 zhú or else the 索子 suǒ zǐ ‘suit’ or ‘woven thread suit’. The '1' is usually a picture of a bird; often a sparrow 麻雀 má què by which the game is named in teh south. The bamboos are also known as ‘soks’ or ‘bams’. 36 Number tiles in 4 identical sets of 9 tiles with the characters for the numbers 1 to 9 engraved on them. The character for 万 wàn萬 10,000 or myriad is underneath each Chinese number. They are also known as ‘wans’ or ‘craks’. Old Chinese coins were often strung together in hundreds, a hundred of such strings represented a large number of coins - 10,000 and is often used to mean ‘countless’ or ‘beyond measure’. The circles, bamboos and numbers form the 序数牌 xù shù pái (the ‘serials’) and only these tiles can form runs or ‘chows’. The ones and nines at the ends of the sequence are called ‘terminals’ or 纯幺九 chún yāo jiǔ. The terminals can contribute to high scoring hands. There are 12 Dragon tiles in 4 identical sets of 3 tiles: red; green and white dragons. Collectively they are also known as the 三元牌 sān yuán pái three scholars, the change to ‘dragons’ may be a result of the export to America. 红中 hóng zhōng (Traditional 紅中 ) Red dragon or Red center 青发 qīng fā (Traditional 青發 ) Green dragon or Green fortune 白板 bái bǎn Blank or White dragon or White board. The white dragon is often a blank tile but may be just a blank frame. The 12 dragons and 16 winds together are called 番子 fān zǐ ‘the Honor’ tiles. All these groups together gives a total of: 36 circles + 36 bamboos + 36 characters + 16 winds + 12 dragons + 4 flowers + 4 seasons = 144 tiles or 牌 páis. The original Chinese game did not include the flowers and seasons so the total was 136. However, some American sets also have 8 joker tiles that add a little more complication. In Singapore there are sets where there are extra pairs e.g. cat and rat. 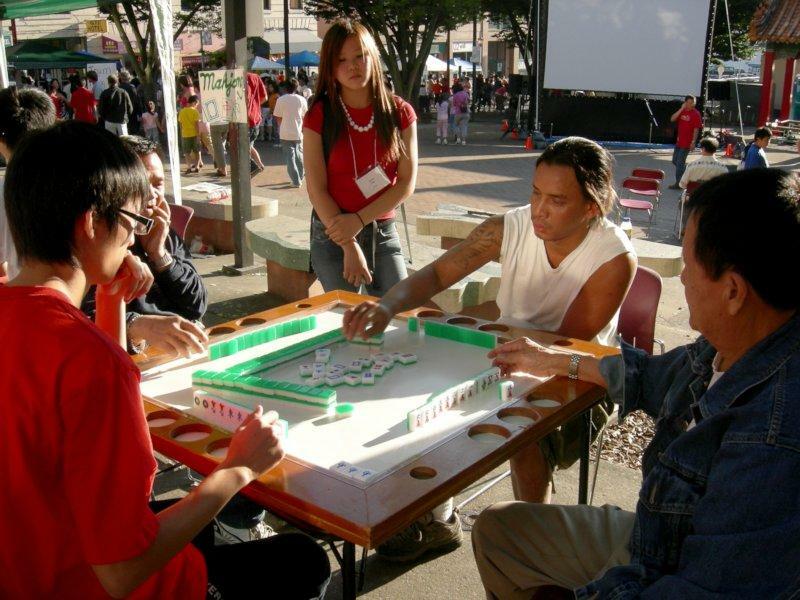 The game usually has four players who take it in turns to pick up tiles to try to form sets. The first task is to shuffle the tiles, all players take part by moving them around with both hands, with the faces of the tiles downward. Then the wall is built. The square 牌墙 pái qiáng wall is 18 tiles wide and 2 tiles high in a square, face down. The dealer then throws three dice to determine where to start dealing out the tiles. The score (1-18) determines which wall and part (quarter) of the wall start point. The dealer then takes four tiles from the left of this position and the other players take a set of four until they all have 12 tiles (3 sets of 4) moving clockwise around the wall. Each player then finally takes a single extra tile in turn to make a total of 13 tiles. A quicker version just takes the tiles from a corner of the dealer's portion of wall. At this stage if any player has a ‘flower’ or ‘season’ tile these are set aside (used for scoring bonuses) and an extra tile is picked up to replace them. All players are associated with a compass direction. East - South - West - North. After each round the designation of 'dealer' or East wind moves around one place anti-clockwise. The game is complete when all four players have been dealer. Whenever the dealer wins a hand or if there is no winner (a draw) an extra hand is played. East starts the game by discarding a tile. Who starts is often decided by throwing a die (highest number wins) or else by drawing the 'East wind' from the set of four wind tiles. The dealer who casts the dice and first picks up tiles is called 'jonga' (庄家 zhuāng jiā). If the dealer has a complete 'winning' hand this can be announced and put down, otherwise he chooses a tile and discards it into the central area 牌池 pái chí 'floor' between the walls. Play now moves anti-clockwise to the dealer's right (South). Each player can then take from either the wall or the pool of discarded tiles in the middle. A player can steal or 'meld' by picking up a discarded tile rather than one from the wall. This can interrupt the order of play, as any player can do this, the player who picks up the discarded tile must put down the 'meld' (which can not be an ‘eye’ unless it completes a mahjong). The player resumes to this player's right. Each player's go follows the same pattern : take a tile, optionally puts down completed groups and then discard a tile. The order is counter-clockwise. A player should always have 13 tiles in total. Just as in the setup, if a 'flower' or 'season' tile is picked up this is immediately put aside and another tile taken from the wall. The aim is to collect groups and runs of tiles. A winning hand is made up of four groups of related tiles. The complexity comes from the large range of possible sets and the need to work out what other players may be collecting - on the basis of what discards they pick-up or the tiles they discard. For a more detailed account and diagrams explaining the playing of Mahjong please see Sloperama page ➚ . Pair 对 duì. Two identical tiles of any kind. e.g. 4 circles and 4 circles. Chow 顺子 shùn zǐ or 吃 chī is a run of three serials in order.e.g. 4; 5 and 6 of circles. Pung or Pong 刻子 kè zǐ or 碰 pèng is a set of three identical tiles of any kind. e.g. 7; 7 and 7 of bamboo. Kong 杆 gān is a set of four identical tiles of any kind. e.g. all 4 east wind tiles. Eye 眼 yǎn is a pair of tiles in a winning hand that is independent of the other sets so a pair of 4 circles would be an eye only if 4's and circles do not feature in the other sets. The rules associated with forming a complete group called a ‘Kong’ are different to the other groups. A player can choose to declare a Kong and lay it down but with only two tiles exposed. If a player makes a Kong using a discarded tile the discarded tile is placed on top of the other three. A player can also add to their existing Pung with a picked up (but not discarded) tile. The fourth tile forming the Kong is not counted, the player picks up an extra tile from the wall and discards one. When a player reckons they have a winning hand he/she calls ‘Mahjong’ and the scores for all the hands are counted up, the person calling Mahjong might not have the most points and so did not really win the hand. However if there are no more tiles left to pick up from the wall then it is a draw and a new game is started. Scoring is complicated due to specific combinations of sets being given bonuses. For example Seven Pairs; Thirteen Orphans; Heavenly Gates; The Coward; All pungs; All chows. There are different scoring conventions in China (Chinese Classical or CC), Shanghai (New style), Singapore, Hong Kong (HKOS), UK, America so this must be announced ahead of the game. A winning hand must score at least a minimum number of points. When a flower or season tile is picked up it is immediately put down and does not take part in the building of sets, it is used to give a bonus once a winning hand has been declared and the scores are totted up. Citation information for this page : Chinasage, 'The Chinese game of Mahjong', last updated 6 Feb 2018, Web, http://www.chinasage.info/mahjong.htm.